Making good on a promise/threat from back in March, Hasbro’s Steven J. Davis has confirmed that his company has finished planning “the next 10 years of Transformers.” That comes from Variety, which also notes that those 10 years will see the release of not only a fifth Transformers movie, but a sixth. And a seventh. And an eighth. Yes, by 2025, the Transformers series will have run for almost as many movies as Star Wars, making it a rare double-tetralogy. This is all thanks to the noble and tireless work of the Transformers writers room, which was assembled earlier this year from some of the brightest minds in Hollywood (and the guy who wrote X-Men: The Last Stand). 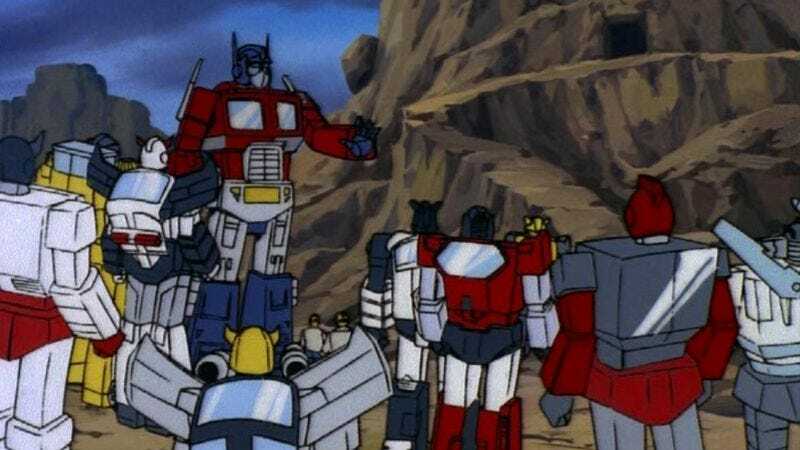 That writers room also spawned an upcoming animated Transformers spin-off, which—as far as we know—won’t count as number 6, 7, or 8. That means there are probably even more Transformers movies we can look forward to! As we’ve previously reported, Michael Bay hasn’t officially signed on to direct any of these future movies, but we assume Hasbro and Paramount will do everything they can to keep him on board. After all, Bay’s talent for choosing where to put explosions is just as integral to this series as annoying humans and their dumb jokes about pot brownies, so we can’t imagine Transformers without him.